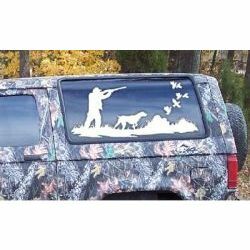 Quail hunter silhouette decal available in several colors. If you love following a brace of pointing dogs as we do then this is the decal for all diehard Bird hunters. Add one to your hunting rig today! 26" X 11" in size. 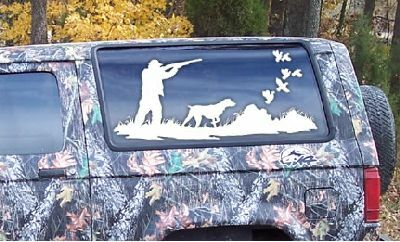 These Game Bird Hunting vinyl decals and stickers are for display on trucks, cars, trailers, boats, gun cases & other smooth surfaces.